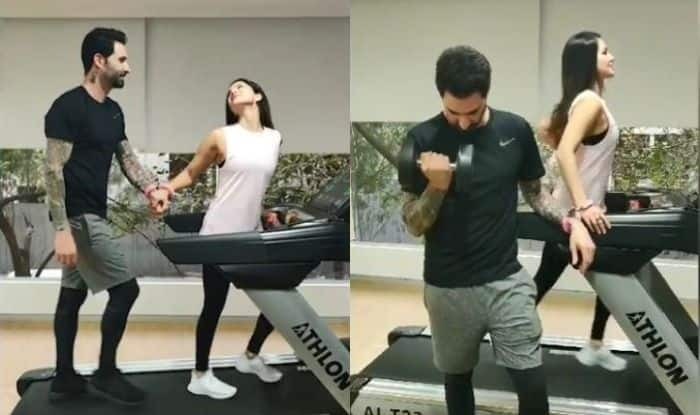 Check out Sunny Leone's latest workout video with her husband. Sunny Leone and Daniel Weber are one of the most fun loving couples. We have seen them goofing around at the airport, dancing their hearts out on the streets and more. The couple took craziness to some other level when they aced handcuff challenge at the gym. This is the new fad that has hit the internet and it seems like these two stars have perfectly nailed it. In the video, they can be seen working out while handcuffed to each other. It will be interesting to see if any other celeb takes this challenge in the future. It seems like the new challenge has been introduced to promote Just You and I by Tom Walker. Earlier, Kiki Challenge went viral when Drake released In My Feelings. Sunny recently attended Dabboo Ratnani’s calendar launch. She shared some light moments with Kartik Aaryan. The lady went bold for the photoshoot and again proved that she is one of the hottest B-town actresses. She has also been into the news for her music video ‘Lovely Accident’ that went viral on the internet and has garnered love. On the professional front, Sunny is currently hosting MTV Splitsvilla Season 11 with Rannvijay Singh. She will be making her Tamil debut with Veeramahadevi. A couple of days back, Sunny also announced that she is all set to feature in a special dance number with Malayalam megastar Mammootty for action movie Madhura Raja. The actress rose to fame with the TV reality show Bigg Boss. She made her Bollywood debut with Mahesh Bhatt’s movie Jism 2 which bagged her recognition. Later, she featured in many films like One Night Stand, Ragini MMS 2 and more.